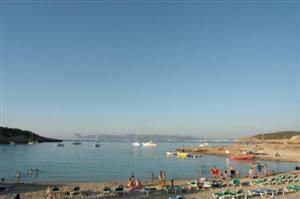 Situated between Cala Conta and Port Des Torrent, Cala Bassa is a popular family beach in the summer months. It is surrounded by a shady pine forest giving you somewhere cool and shady to escape to if the heat gets too much. The interesting rock formations towards the edge of the beach are idea for jumping off in the crystal clear water below. There are several water sports on offer here incluidng water skiing and the classic banana boat and you can even catch a boat over to San Antonio. There is plenty of free parking available and there is also a restaurant making Cala Bassa an ideal beach for a day out.